A quick glance at the seller’s business card should have set off alarm bells for clients about to pay thousands of dollars for the artwork she was offering. Not only is her own name spelled incorrectly: “Laura Loiuse Johnson” but she is the director of an art gallery that does not exist. There is no John Street Galleries in Sydney’s Woollahra, as her business card suggests, and no such business name is recorded with the Australian Securities and Investments Commission. In Andrew Bolt’s World, Black Is White And Peaceful Protest Is War | newmatilda.com. All the recent declarations that 2014 was the hottest year on record seems to have prompted a spate of panic denial among climate change contrarians, denialists and ideologues. We’ve had a declaration of one of the “most extraordinary scandals of our time” from UK climate science manglers Christopher Booker and James Delingpole. The accusation is that climate scientists have been “fiddling” the world’s temperature data with the express motivation of showing the world is warmer than it really is. This was sparked by a blog from a retired accountant and climate sceptic who “discovered” that data from three temperature stations in Paraguay had been altered when NASA compiled its global temperature record. Fellow Guardian blogger Dana Nuccitelli has a rundown. But more on this in a bit, because I’d like to turn to the button-down mind of Maurice Newman, Tony Abbott’s handpicked chief business advisor. Newman, who thinks human-caused climate change is a “myth” and a “delusion”, also bought into the great new conspiracy that climate scientists are fiddling temperature data. But Newman also decided he would try and pin the deaths of thousands of British pensioners at the feet of renewable energy policies and “political elites” who back action to cut greenhouse gas emissions. It is a fact, according to British charity Age UK, 3.5 million elderly Britons are at risk from winter cold. It is estimated 25,000 “excess winter deaths” across Britain will result from the inability of the poor to afford power because renewable energy policies have driven it beyond reach. Back in the real world, the poor are dying of the cold while the political elites and their friends bask in the warmth of cosy conferences, taxpayer subsidies and research grants. Did Age UK really say those excess winter deaths would result from “the inability of the poor to afford power because renewable energy policies have driven it beyond reach”, as Newman claimed? The sad fact is that many of these deaths could have been prevented. Cold homes, caused by a number of factors including poor insulation and high energy costs, are a major cause of excess winter deaths. In the short term we would urge all older people to claim the benefits they’re entitled to so they can afford to turn the heating up and stay warm. However the only long-term solution to this problem is an ambitious government-led programme to bring all our housing up to a high energy efficiency standard. Notice there’s no mention of “renewable energy policies” which Newman claimed the charity had blamed for driving energy prices higher. In fact, the charity says the key to reducing the risk of death from cold among pensioners is to improve the energy efficiency of their homes. But what about those high energy prices in the UK mentioned by the charity? Research from the UK’s government-backed Committee on Climate Change found that between 2004 and 2011 the average annual energy bill in the UK went up from £610 to £970. 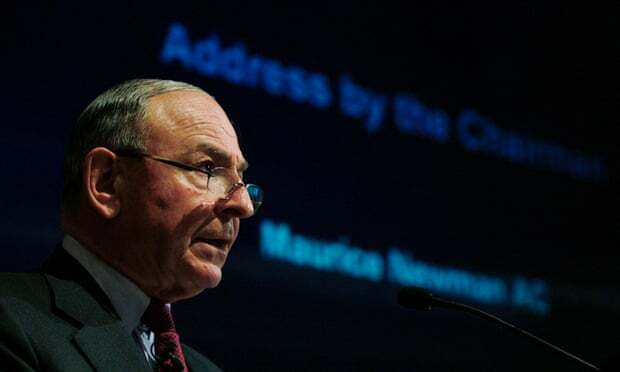 Of course this isn’t the first time Maurice Newman has misrepresented research to service his paranoia and conspiracy theories over climate change. We’ve played this game of whack-a-mole before. In January, analysis of global temperature data from NASA found that 2014 was likely the hottest year on record, although the fine print shows that statistically it tied for first place with 2010 and 2005. Tying for NASA’s fourth hottest year were 1998, 2002, 2003, 2006, 2007, 2009 and 2013. According to NASA’s analysis, the 15 warmest years on record have all occurred from 1998 onwards (the year at which many ‘sceptics’ claim, wrongly, that global warming stopped). The UK’s MetOffice also put 2014 as a tie for the warmest year on record. The Japanese Meteorological Agency had 2014 as outright warmest, as did the US National Oceanic and Atmospheric Administration (there’s a good explainer on different measures of global temperature at NASA’s Earth Matters blog). Analysis of satellite measurements of the lower troposphere also had 2014 in the top ten warmest years. As the World Meteorological Organization Secretary-General Michael Jarraud pointed out, the ranking of any individual year isn’t as important as the longer term trend. Fourteen of the fifteen hottest years have all been this century. We expect global warming to continue, given that rising levels of greenhouse gases in the atmosphere and the increasing heat content of the oceans are committing us to a warmer future. All this talk of hottest years put the climate denialist community into a tailspin, with Booker, Delingpole, Newman and others claiming the whole thing was a scam. Again I’d refer you to Dana Nuccitelli’s analysis. But let’s be absolutely crystal clear about what is being alleged. The allegation is that climate scientists in agencies across the world are altering temperature data taken by some thermometers and that this alteration is motivated entirely to make it look as though the world has been warming more than it really has. There is not a shred of evidence for this global conspiracy. There is no secret tape of climate scientists and meteorologists huddled together agreeing how this elaborate scam will be pulled off. No email trail where scientists discuss the records they’ll choose. No grand scam hidden in the methodology. At the same time, there is more than ample information in the public domain – where it has been for many years – showing how global temperature records are put together from the millions of pieces of data generated by thermometers across the planet on land and floating in oceans. Neither do these so called ‘sceptics’ (generally they are not sceptics) mention the rapid and accelerating melting of ice sheets at both poles, the heat build up in the world’s oceans or the rising sea levels – all of which are clear signals of a warming planet before you’ve even shot a glance at a thermometer. What some conservative commentators and bloggers are doing is denying or discarding this information and replacing it with innuendo and a conspiracy theory for which they have no evidence. The reason there’s no evidence for it is because this conspiracy theory is pathetic and embarrassing bunk. Again, it is not a secret that some temperature readings do undergo changes – and those changes can return higher or lower values. As a NASA spokesperson explained to Media Matters, “the largest adjustment in the global surface temperature record occurs over the oceans” and this “actually lowers global temperature trends”. But why would you selectively change some data collected by thermometers when you analyse it? When networks of weather stations were set up around the world, they were not designed to be a long-term record of the climate. Rather, they were there to record the weather from one day to the next. Let’s say that you have a record of temperature readings from a weather station at, oh I don’t know, Denierville (not an actual place). In Denierville, temperature readings are written down every day for decades, with only the occasional missing day. For that temperature to give a true reflection of Denierville’s climate over the decades, you need to know a few things. For example, was the temperature taken at the same time each day? Was the thermometer always in the same place, or was it moved across town or around the corner in a shadier spot? Have trees or buildings popped up around the thermometer, or have they been taken down? How about if your thermometer was out in the open air in full sun but sometime ago was placed inside a box or a piece of standard equipment (like a Stevenson Screen), biasing the new temperatures low? Would you allow for that? What if you want your Denierville temperatures to be part of a network of climate records? Were your thermometers calibrated and checked in the same way as all the others? Unless you make allowances for things like this, then the raw data you plot on a graph becomes unreliable as a consistent record of Denierville’s climate over time. What if you plot all the temperatures and notice a jump in the data where things suddenly get hotter or colder? Do you ignore that, or do you check to see if the thermometer was changed or moved or if other temperature stations in the region also show the same jumps around the same time? If the other temperature stations don’t show the same jumps, suggesting its not a natural change but something else, what do you do then? Should scientists just ignore all of this or make an allowance for it? If you decide to allow for changes like this, are you part of a global conspiracy, or are you just doing solid science? A scientist can’t ignore those effects. It’s not science to just go ahead and plot that raw data. But what if you did plot the raw data anyway? A member of the team of global temperature analysts at Berkeley Earth, Zeke Hausfather, was curious. Does it confirm the suspicions of the climate science denialists? I’ll let you decide.